In the book, Vaidhyanathan, a former journalist who now directs the University of Virginia’s Center for Media and Citizenship, examines Facebook’s impact on newsrooms, many of which have integrated the social media platform into virtually every step of the news reporting process. 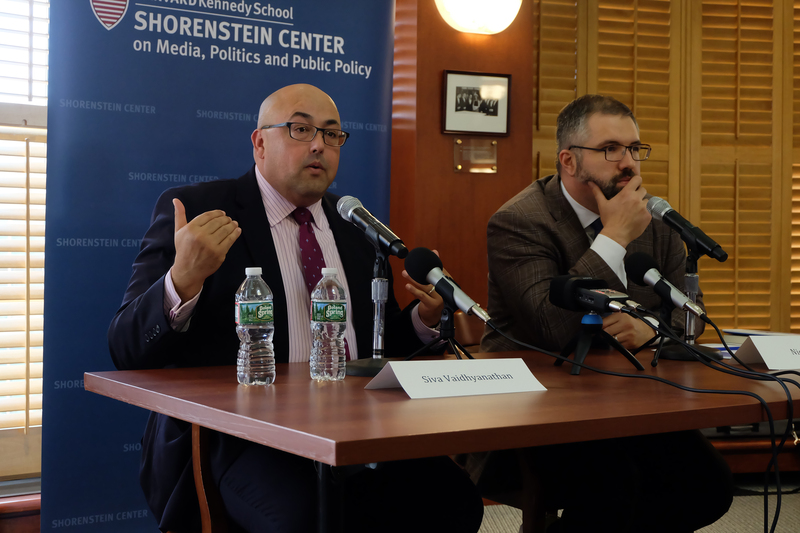 Recently, Vaidhyanathan came to speak at Harvard Kennedy School as part of an event series hosted by the Shorenstein Center on Media, Politics and Public Policy, of which Journalist’s Resource is a project. His visit gave JR an opportunity to ask him more about how Facebook has changed journalism. Below is an excerpt from that conversation — six of our questions and Vaidhyanathan’s answers, which also offer insights on how reporters can do a better job covering Facebook and its influence on the lives of billions of people worldwide. In your book, you talk about the importance of Facebook to newsrooms. And I’ve heard you say that no decision is made in newsrooms without the specter of Facebook. Can you elaborate on that and why that is or isn’t a good thing? What should journalists be mindful of when thinking about how Facebook impacts the way they do their jobs or the way they cover an issue or event? “Even when reporters have the best possible news judgment as their primary motivator, they can’t help but be affected by the draw of click-bait: the sense that some stories, some words and some images are going to attract more attention on Facebook. And they’re quickly told by editors how well their articles or videos moved around Facebook. In many newsrooms, there is a scoreboard posted in the middle of the newsroom with the social media impacts of certain stories … You can’t help but be obsessed by [the editorial analytics platforms] Chartbeat or Parse.ly — those are the big ones. What are the main ideas — or warnings even — that you’d like newsrooms and journalists to take away from your book? Academic research, including a study from Harvard’s Berkman Klein Center for Internet & Society, indicates “fake news” played a limited role in national elections in 2016. But there’s still a lot of commentary and coverage of that issue in the media. There’s a lot of focus on how fake news was shared and distributed via social media sites such as Facebook. Can you speak to whether this ongoing conversation about Facebook and fake news is still important? A lot of national news organizations cover Facebook as a company and issues surrounding Facebook as a national story. But it doesn’t seem to be a focus for local newspapers and other local publications. Should Facebook be covered from a local angle and, if so, how? “Local news organizations should pay attention to what happens on community Facebook pages. That can give them early warning to issues that matter to people and uprisings or demonstrations or protests that might be in the works. The fact that people work out their politics on Facebook these days makes it imperative that journalists understand how Facebook works in their lives. Do you have any other suggestions for things journalists should be doing differently in terms of how they cover Facebook as a company and Facebook as a social media platform? Looking for research on journalism and Facebook? Check out Journalist’s Resource’s write-up on how Facebook has become a substitute for other news sources. We spotlight several studies on digital and social media in this research roundup.